Posted in Government, News, Testing, under Europe. 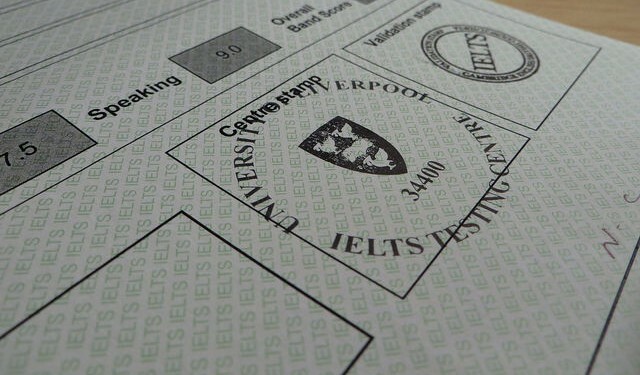 Tagged with Cambridge Assessment, City & Guilds, Ielts, PTE Academic, testing, Trinity College London, UK. As of April 6, Trinity College London and IELTS will be the only two approved providers of Secure English Language Testing used to support UK visa applications below degree level, as part of a raft of changes to visa laws due to be laid before parliament on February 26. Only Trinity and IELTS, which is jointly owned by the British Council, IDP: IELTS Australia and Cambridge Assessment, will continue to offer SELTs. Photo: comedy_nose. "The Home Office has gone through a huge level of detail concerning how the tests are delivered, the kind of security arrangements that are in place"
There are currently four designated SELT providers, of which only TCL and IELTS, which is jointly owned by the British Council, IDP: IELTS Australia and Cambridge Assessment, may be used to prove English language proficiency in an immigration application once the changes come into force. IELTS will be the only SELT available worldwide, while the TCL exams must be taken in one of ten exam centres around the UK. The changed regulations, which follow a tender process beginning in Autumn last year, mean that the City & Guilds IESOL, ESOL and ISESOL qualifications and Pearson Test of English Academic will no longer be designated SELTs. They also exclude all Cambridge Assessment exams other than IELTS from the list. However, all currently approved exams taken on or before April 5 will be accepted until November 2015 to ensure a smooth transition. The change stems from a Home Office review that began after a BBC exposé revealed cheating by candidates on an ETS TOEIC exam, leading to allegations of systematic exam fraud. As a result, ETS opted not to renew its licence agreement with the Home Office to provide Secure English Language Testing in April last year. The approved IELTS tests will include a new IELTS Life Skills test to be launched in April, targeting people who need to prove their speaking and listening skills at level A1 or B1 of the Common European Framework of Reference. TCL’s Chief Executive, Sarah Kemp, said the decision to use Trinity as a SELT provider is a “real endorsement” of its approach to the exam and attention to content. “The Home Office has gone through a huge level of detail not only concerning what the tests themselves contain but how the tests are delivered, the kind of security arrangements that are in place,” she explained. Outsourcing was another issue weighed by the Home Office, requesting that exam centres be brought under the direct control of test providers, which led Trinity to acquire English Exam Centres, a nationwide chain of centres which it has worked closely with in the past. Meanwhile, a spokesperson for Pearson told The PIE News: “As a global education company, Pearson regularly receives and assesses Requests for Proposals for government contracts. Pearson also said that PTE Academic will continue to operate “as normal” in the UK, and that it will work closely with test centres, agents and partners to minimise disruption to business. The Home Office has confirmed that the information provided by the exam providers is correct, but told The PIE News that it would not publish further details before the legislation is presented to parliament. Full details of approved SELT tests from April 6 2015 are available here.